Rux Martin/Houghton Mifflin Harcourt, 9780544252325, 352pp. Long celebrated as a versatile ingredient in cuisines across the globe, yogurt has recently emerged as a food of nearly unparalleled growth here in the United States. The time has come for a modern, far-ranging cookbook devoted to its untapped culinary uses. 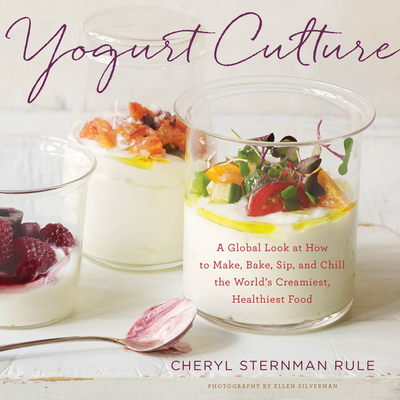 In Yogurt Culture, award-winning food writer Cheryl Sternman Rule presents 115 flavorful recipes, taking yogurt farther than the breakfast table, lunchbox, or gym bag. Rule strips yogurt of its premixed accessories and brings it back to its pure, wholesome essence. In chapters like Flavor, Slurp, Dine, and Lick, she pairs yogurt not just with fruit but with meat, not just with sugar but with salt, not just with herbs but with fragrant spices whose provenance spans the globe. She provides foolproof, step-by-step instructions for how to make yogurt, Greek yogurt, and labneh at home, though all of her recipes can also be prepared with commercial yogurt. CHERYL STERNMAN RULE is the author of Ripe: A Fresh, Colorful Approach to Fruits and Vegetables. Her blog, 5 Second Rule, was named best culinary blog of 2012 by the IACP and best writing blog by Saveur in 2014. Her work has appeared in Cooking Light, EatingWell, Health, Vegetarian Times, and more.